Humbling when I think of my work, those in my immediate space, my most weighty relationships, my marriage, my parenting. You want to see the way a person loves? Look at the way they notice, care, and treat their spouse, their children, their family. It's true. That's where the good or bad of our heart overflows. That's where we see what is real. Marriage and parenting are not for the weak. Or said another way, not for the proud. It takes humility, guts to face and work through unpleasant truths, compromise, regular consideration for the others involved, grace. 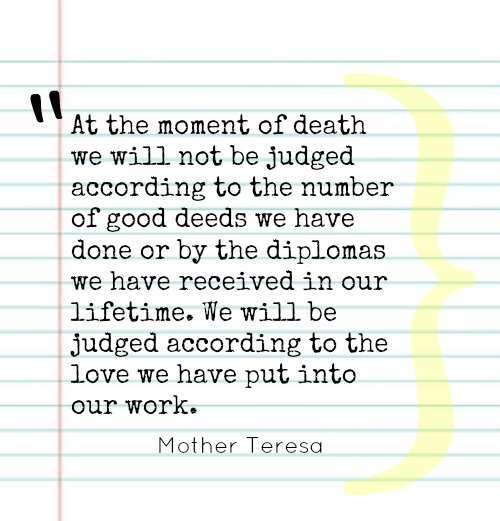 I adore Mother Teresa; I have since I was a child. She, a simple woman, exuded love, the Love found in Scripture. truth, pure and simple. i was walking around my back yard this morning, asking God to help me love the people around me well, starting with those closest to me...because they sometimes get the crusts and crumbs, y'know? and that's no good at all. i too am a hearty fan of the late mother. she knew a thing or two about tenderness and faith and loving. what a beautiful servant. Beautiful, tender, true. May the Lord help me to love like He loves. Thank you for posting.